Whenever I buy red cabbage (or any cabbage, for that matter), I have it around for weeks. I like the bit of crunch it adds to my tacos but I hate the space it takes up in my fridge while I try to think of uses for the rest of it. This recipe probably looks a little familiar – after I made last week’s rice bowl, I made these tacos out of nearly the same ingredients. (Cook once, eat twice, I say). 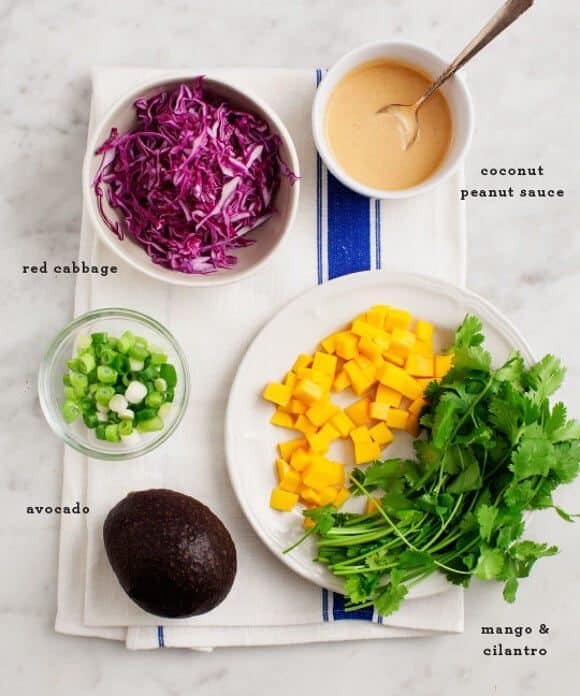 I used up more of my red cabbage, diced mango, avocado and that tasty coconut peanut sauce. These are sweet, savory, crunchy and a little spicy – in other words, my four food groups. Under all of that, there’s tempeh that I lightly marinated and seared. Feel free to sub in any protein you like – the toppings are really the star here. Drizzle tempeh strips with olive oil and tamari. Set aside to marinate while you prep everything else. Mix together the sauce ingredients. (I do this in a jar with a tight lid - shake until combined). Taste and adjust seasonings. In a small bowl, toss red cabbage with a squeeze of lime and a pinch of salt. Heat a medium skillet over medium heat. Add the tempeh strips and cook for a few minutes on each side, until golden brown. Assemble tacos with tempeh strips, red cabbage, mango, scallions, avocado slices and cilantro. 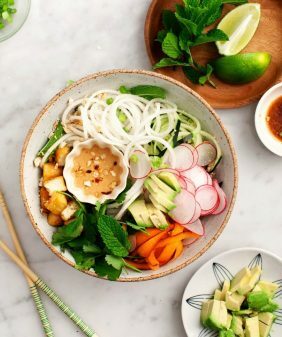 Serve with coconut peanut sauce, limes and sriracha on the side. I can’t resist anything with a coconut peanut sauce! I can’t wait to try the recipe!!!! This sounds delicious! I’ve got to try this tempeh.. it’s been too long! I’m obsessed with tempeh and mango together lately. And yes, cabbage is annoyingly large. When do they start making mini cabbages? That would be so cute! Why do I always look at your stuff pre-breakfast… love! I love this combination of flavors! I haven’t seen good mangos lately though. I’ll keep an eye out. 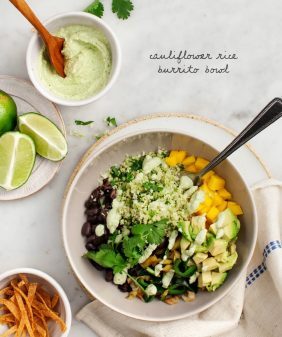 Rice bowl or tacos, I love the flavor combination here, as well as your addition of tempeh. 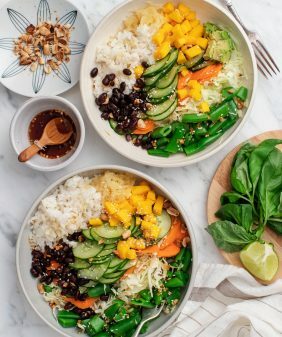 Making your rice bowl this week! These ingredients are definitely worth repeating. I love the mango in everything. These tacos are amazing! Totally made my Monday. Lovely! Everything is always so lovely. I feel like I say lovely in almost every single comment I leave. Ah well. 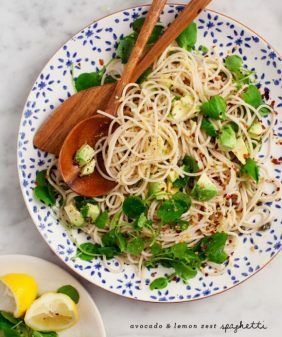 The coconut peanut sauce is so unique and it’s completely selling me on this dish. I don’t think I’ve ever seen something like this before. 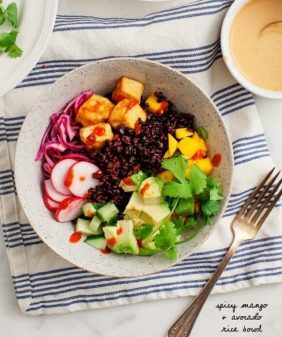 I love how you’ve re-purposed your ingredients from the rice bowl last week. Cabbage is so versatile and adds such a wonderful crunch to dishes, but you’re right that it lasts forever! I love the Asian twist on these tacos. I made this tonight with black beans instead of tempeh. Added some 5-spice, soy sauce, and sesame oil to the beans. This was so good, I could have eaten it all myself. Thanks for a wonderful recipe! So simple and so good! beautiful photos & great recipe idea. I will definitely be recreating this in my kitchen! Made this tonight – it was SO good! I will definitely make this again! Thanks for the great recipe!! Your recipes are always so surprising! 🙂 That coconut sauce sounds incredible. Love how there is something unique in every post of yours! Tempeh always freaks me out! I love the taste but prepping and cooking it intimidates me. I guess the secret is to marinate…? These look so amazing. The colours and ingredients look so enticing! 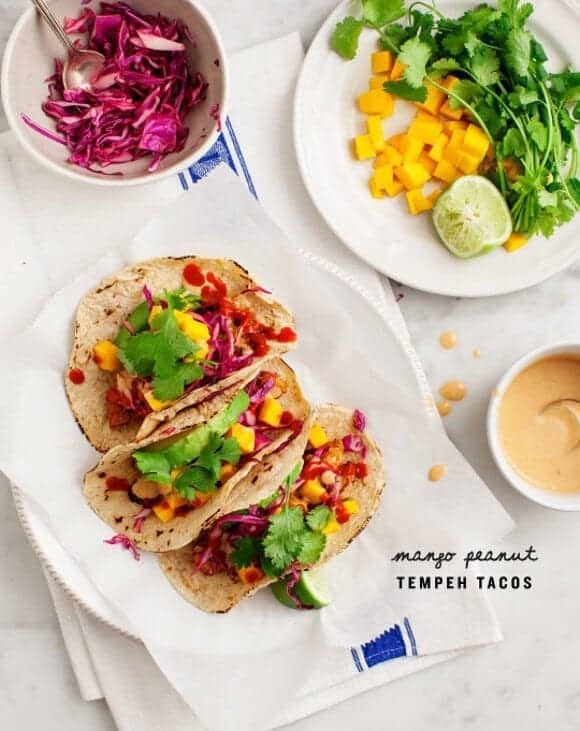 I love how bright and colorful this mango peanut tempeh tacos is; it looks so inviting and delicious! Saw this featured in a Buzzfeed article and HAD to make them. Peanut sauce on anything wins me over and I’ve never heard of adding coconut milk to it. Needless to say, the tacos were as beautiful as they were totally scrumptious. Thumbs up from everyone in my house! Hi Kayla, I’m so glad you (and your family) liked them!! very good vegetables can make a wonderful meal . I love that salad, it’s one of my favorites. This was damn good. 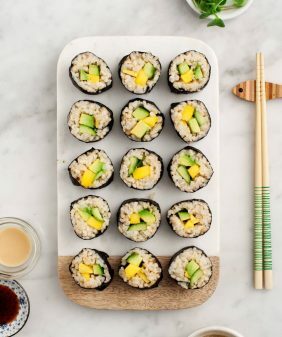 I was interested in trying it because I’m a sucker for a peanut sauce and, hey you throw mango and avocado into the mix–I’m sold. What I wasn’t convinced about at face value was the cabbage. Beautiful? Obviously. But I’m not generally a fan. But I knew this recipe would need some crunch so I followed the recipe to a T, including the key ingredient in the cabbage slaw: lime juice. Wow. The lime juice took the cabbage to the next level. So I guess I love purple cabbage now. And I really, really love these tacos. The crispy, salty tempeh with the sweet mango: divine.